HP Pavilion g6 is a popular family of 15.6-inch low cost and medium range laptops. The latest addition to the line, the HP Pavilion g6-2200 series brings the Windows 8 and multi-touch touchpad to the popular laptop line. 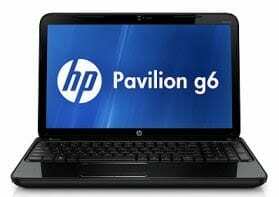 HP Pavilion g6 Price in Nigeria starts at around 75,000 Naira depending on the configuration and your location. Cheaper models may also be available. If you need more information, read our HP Pavilion g6 article. HP Pavilion g6 price in Nigeria depends on your city or town of residence and/or the computer store you choose to buy from. You can buy from leading computer stores in Nigeria or from reputable online stores in Nigeria. NaijaTechGuide does not offer any price guarantees, HP Pavilion g6 Price in Nigeria may change without being reflected on this page immediately. We will be adding prices of more models in future. These are only price suggestions. The price listed on this page is in Nigerian Naira.